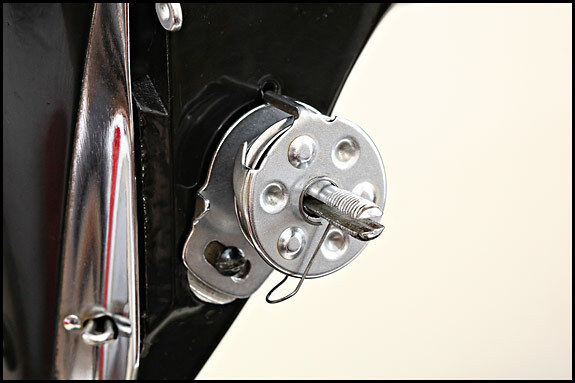 In the previous post on this subject, we looked at how to set up the 201 top tension adjustment. This time we’ll look at how the other half of the top tension assembly fits together, and see how to adjust both the check spring tension and the position of its stop. Because it’s the putting back together which gives most folk grief rather than the taking apart, we’ll start with all the components of the top tension assembly removed from the machine. We’ll go through this on a Mk2, but it’s just the same on a MK1, and don’t worry if reading this explanation scrolls your nerd. It makes more sense when you have the bits and bobs right there in front of you. Honest. 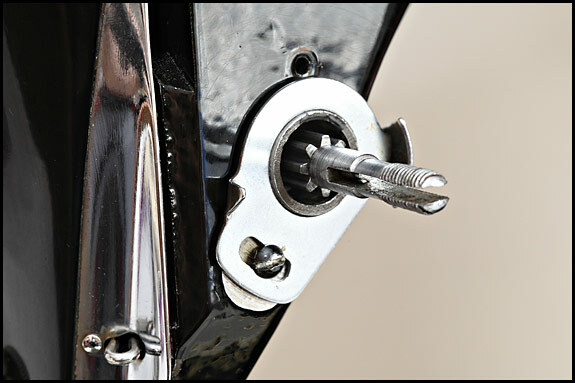 and here’s the tension stud with, in the foreground, the tension releasing pin. 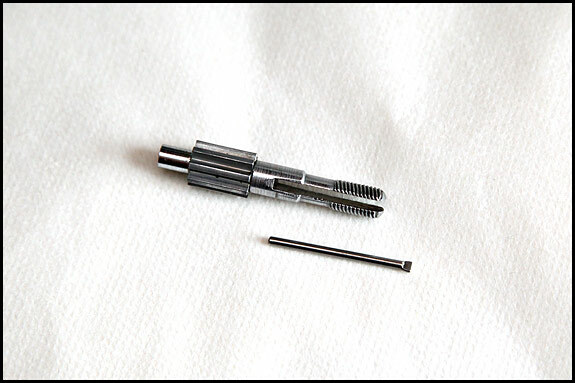 The tension releasing pin lives inside the tension stud and it’s important, because without it, your top tension won’t release when you raise your presser foot and you will be sorely vexed. 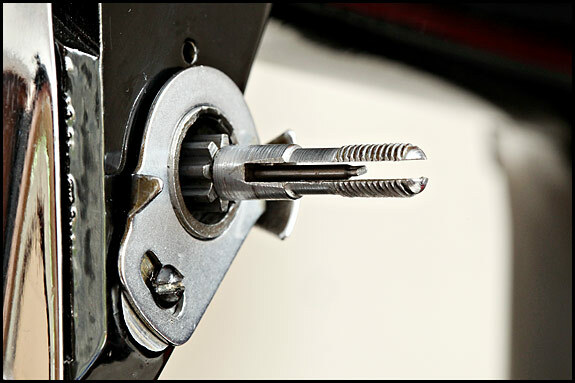 In theory, you fit the tension stud by pushing it into the hole in the machine body as far as it will go, making sure that the end of the slot up the middle of it is horizontal, then tightening up that grubscrew to which the arrow’s pointing in the top picture. That should leave 2mm or thereabouts of the splined part of the stud (the cog-wheely bit) proud of the metal surrounding it. In reality, it often takes a careful tap with a hammer to make sure that the stud’s properly seated, but don’t hit it unless you’ve first screwed onto it the thumb nut (by means of which you normally adjust your tension) so that it’s level with the end. That’ll prevent any damage to the threaded part of the tension stud. It’s probably best to play safe and use a wooden or leather mallet, or hold a bit of wood against the end of the stud then tap (not whack) that with your hammer. 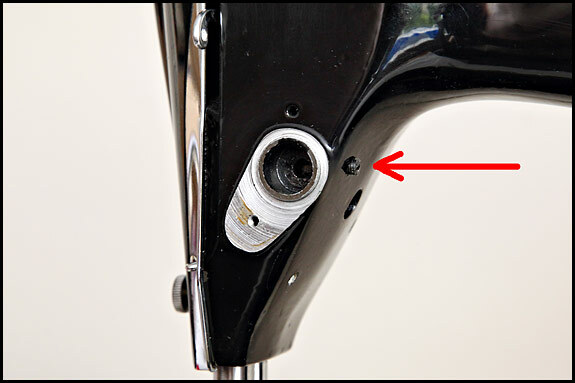 Don’t forget to tighten that grubscrew when you’re sure it’s in right, and note that if you don’t have the slot in the stud horizontal, the datum marking on your tension indicator won’t be at top centre like it should be when you replace it. Now take off the thumb nut if you put it on, insert your tension releasing pin, and then fit the shiny wossname round the whole works as shown below. 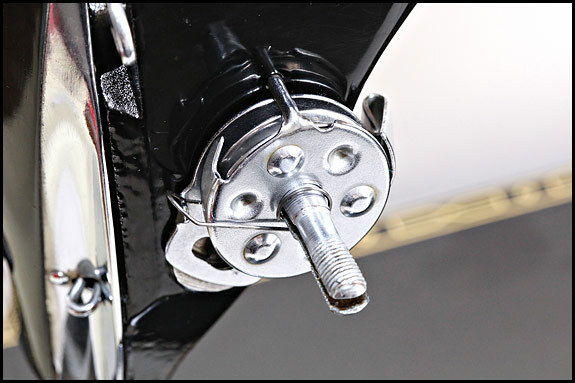 The proper name for the shiny wossname is the Slack Thread Regulator And Tension Thread Guide, but whatever you like to call it, fit it for now with its fixing screw central in the slot. Incidentally, your tension pin will go in further than the one in the photo above. 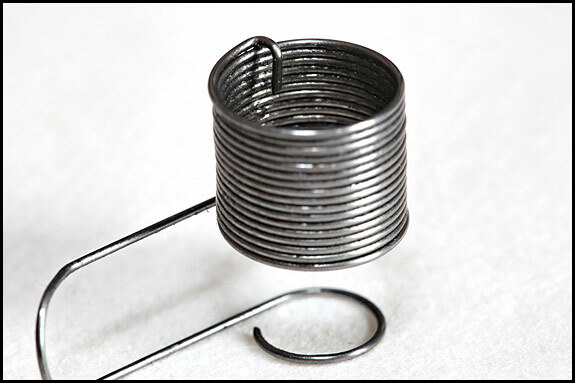 In the picture above we have, from the left, what is properly called the Thread Guard Spring but is commonly called the check spring, then the Thread Guard and then the two tension discs. 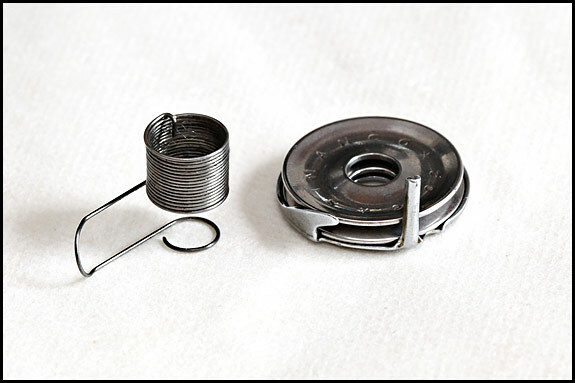 Before we go any further, though, check out that little hooky bit which is bent in on the coil of the check spring, for it is that little hooky bit which is the key to understanding both how the check spring works, and how it all goes back together. 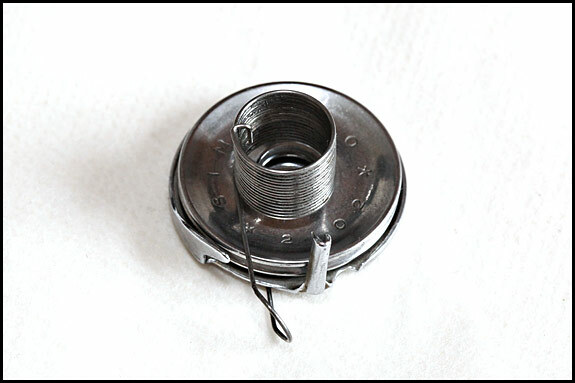 OK, so we put the two tension discs together with their flattened faces facing each other, and sit them on top of the thread guard like in the picture above. so that we end up with it all looking like this, although it doesn’t matter for now where the loop in the spring is positioned relative to that metal finger (which is another way of saying that when I took this picture, my brain wasn’t paying attention). 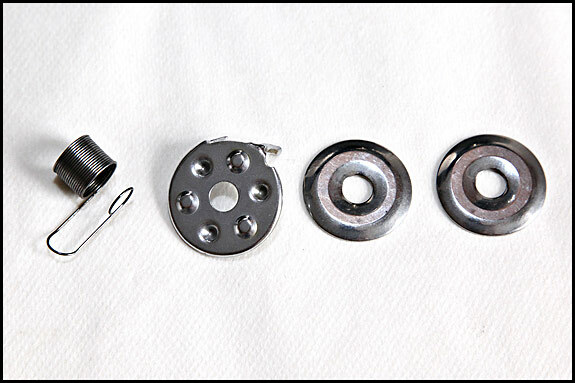 What matters is that the flattened sides of the two discs are together, and the big coil of the check spring is on the same side of the discs as the sticky-uppy finger. Just so you can see how this business with the check spring actually works, we’re now going to fit it together with an invisible thread guard and tension discs. 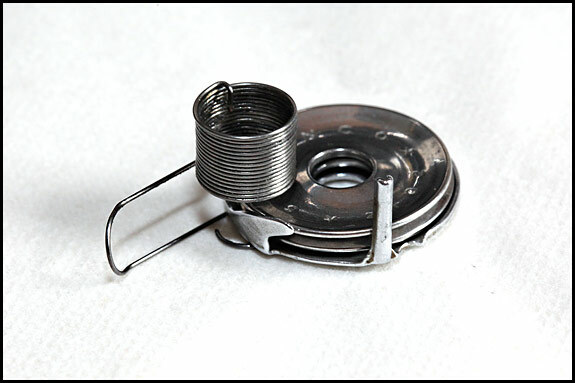 Slide the spring over the tension stud with the loop in it hanging down, ideally between 5 and 6 o’clock, and wiggle it until the little hooky bit inside the coil drops into and slides along one of the grooves in the cog-wheely bit. Push it in as far as it’ll go, then swing the loop of the spring up to rest on the sticky-outy bit of the shiny wossname as shown above. 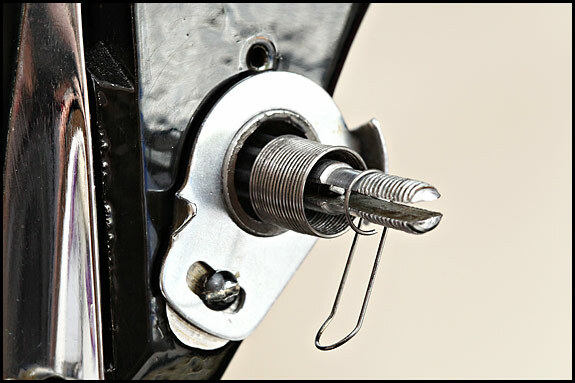 The little hooky bit on the inside of the spring is now held in what is likely to be the right groove on the stud (because you fitted the spring with the loop hanging down), so the amount of tension that the spring’s under when you rotate it that quarter turn clockwise onto its rest will probably be about right. But if it isn’t, how do you alter it? 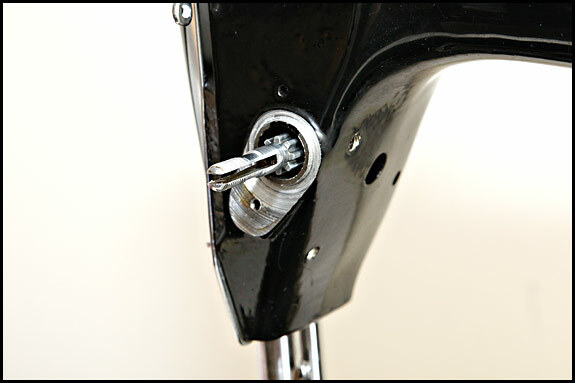 Easy – slide it out and put it back with the little hooky bit in the next groove to the left for more tension, or next to the right for less tension. and slide the whole lot over the stud, holding the bits together and with the spring dangling down. 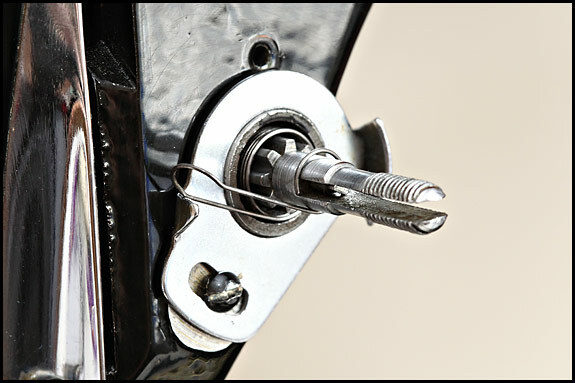 The fun bit is then jiggling it all so that the loop of the spring stays hanging down, the finger of the thread guard locates in the hole in the body of the machine, and the little hooky bit on the spring slides along one of the grooves in the stud. so that it rests on top of that little stop. Before you go any further, just check that if you press the thread guard in towards the machine and lift the end of the loop of the spring up a bit, it’s under noticeable tension and it springs back against the stop when you release it. From here on in, assembly of the remaining parts of the top tension is simply a matter of following the sequence detailed in Part One except we then need to set the position of the Slack Thread Regulator And Tension Thread Guide a.k.a. the shiny wossname. We fitted that with the fixing screw central in the slot, but we now need to see if it needs adjusting. There seem to be three schools of thought here. The first says its position doesn’t really matter so screw central in the slot is OK. 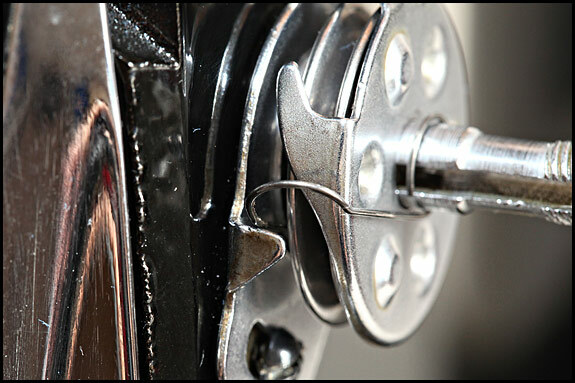 The second says that you slacken the fixing screw, rotate the wossname until the loop of the check spring emerges from behind the tension dial at 9 o’clock, then tighten the screw. I subscribe to the third opinion, which is that the position of the wossname is correct when the check spring just contacts its stop as the point of a correctly-fitted standard needle is about to pierce a piece of medium-weight fabric held in place as it normally is by the presser foot. But now, I hear you ask “how much tension should there be on the check spring?”. Alas, unless you have another machine handy to compare it with, the only sensible answer I can think of is “about as much as there is if you put it together as described above, but if in doubt, more is usually better than less”. Finally, I ought to point out that at least one respected guide to vintage Singers says to fit a particular 201 tension part that way but in the above I say to fit it this way. All I know is that this way is what works for me, every time.